When I was in High School I was an avid weightlifter, I trained in Martial Arts, I had a black Labrador named Rocky and my dream was to build a log cabin on 5 acres. 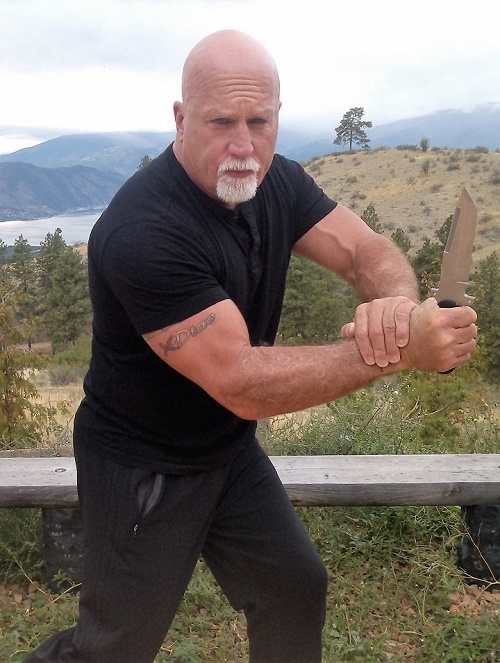 Now I am 62 years old and I still lift weights, I am still training martial arts, I have a black Labrador named Rocky and I live on 5 acres and have an Earth berm home. I clearly knew what I valued as a teenager and I value the things I hold dearly to my heart. Although there have been ongoing changes in my life--children grown and raised, friends come and go, the swift transition of our technological and political world--there are some things that endure in perpetuity. I pride myself in my ability to hold onto what I value, to cultivate the rich soils of my creative, emotional and experiential world, and that process reveals the essence of my core self. I am curious if you do the same in your own life, steadfastly and patiently matriculating whatever brings you the most meaning. Recently, my martial arts teaching career has rapidly changed not in the content or manner of my pedagogy, but rather in the opportunity to spread and proliferate my message to hundreds of thousands of people all over the world, through our online platform. Already, our martial arts library has subscribers in 25 states in the US and in over 23 countries, on every continent except Antarctica. Although I always knew that I would forever be a creator and instructor of martial arts systems, I never dreamed that I would have the opportunity to reach such a diversity of people, and for that I am humbly grateful. As with everything I truly value in life, I am committed to the enduring propagation of our KI Fighting Concepts message for as long as I hold breath. We are in it for the long haul and we plan to continue building new content, new systems and innovative methodologies indefinitely. Our online library will be the everlasting platform upon which we present all of our new training material, and as we speak, our newest training video is being produced. However, the library is just the start, as our vision is to build an online empire for our students. For instance, we will be launching programs that enable you, our subscribers, to achieve rank and attend live seminars where you can test with me personally and earn your Black belt. I am also building a library exclusively for X-Dtac (Extreme Defensive Tactics). This is a system of my own creation that I have been developing for the past 8 years, and one that I believe to be the most efficient and effective fighting technology to date. If you peruse our Facebook, you will find a wealth of information, clips, blogs, and training tips. All of this is provided to you, our viewers, free of charge, and we hope this material inspires you to learn more, train more, and develop your martial arts perspective. However, this content is not intended to be your sole learning modality. In order to successfully execute the movements we demonstrate in these clips, you will need much more depth and breadth, training guidance and practice. This is why it is so important for those who are serious about learning our material to actually sign up for the library, review these videos in their entirety, and steadfastly train these skills. Without the full picture of instruction, you will not be prepared to mimic or replicate these movements in a survival scenario. So please, make the commitment to meaningfully developing yourself into a martial artist who is capable and well-trained. We want to create trained fighters out of those who are currently only spectators and fans of martial arts, and in order to do that you have to take your training seriously and make the commitment to studying in the online library. There are always going to be struggles in life. You have yours. I certainly have mine. What makes the difference is when you can find someone you want to struggle with. Learning martial arts is a struggle--if you are not struggling, you are not learning. In my experience, many people think they already know all they need to know, and are happy and secure in their own zone of expertise and comfort. However, I am fond of saying that I am doing my best work when everyone in the room is a little uncomfortable. That means we only truly grow and progress when we are pushed away from what we regularly do with assured self-confidence. Most fans who like us on Facebook conceive of themselves on some level as being martial artists, which is fantastic! However, to become a serious martial artist, you must embrace discomfort, reach for a higher state of learning, work your weaknesses, be humbled, give up premature accolades and embrace the spirit of the white belt. My hope is that those who value the fighting arts will push themselves to the next level--from fan to serious student, from a bystander seeking entertainment, to an actively training athlete who is steadfastly developing motor skills and muscle memory. For myself, martial arts is one of the permanent fixtures of my life, and I want my teaching to become part of the enduring features of your life as well. Until my last gasping breath, I will be a creative and high level teacher of the fighting arts, this is what I do and it is who I am. We are what we experience--so who are you?